You are buying Abbott Glucerna Nutrition Rich Chocolate Shake 8oz Case of 24, model #57804. ADW Diabetes offers a complete line of dietary supplements for both children and adults. The Abbott Glucerna Nutrition Rich Chocolate Shake 8oz Case of 24 is designed specifically to help adults with diabetes manage their blood glucose levels as part of an overall diabetes management plan. The products contain a unique, slowly digested carbohydrate blend to help minimize glycemic response. 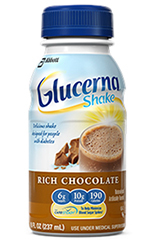 Glucerna cereals, bars, and shakes are available in consumer-friendly flavors at retail stores. Glucerna tube-feeding products for institutional use offer a variety of nutrition choices for supplemental or sole-source nutrition. Glucerna Nutrition is used as a supplement, snack, or meal as part of a diabetes management plan. For use under medical supervision.